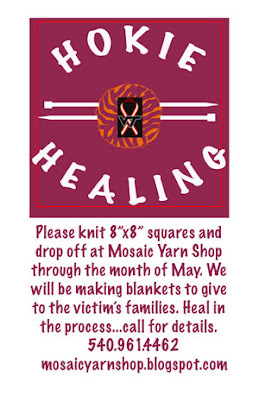 Mosaic Yarn Shop: Just A Reminder...We Update This Blog Daily, So Check The Sidebar To The Right If You Are Stuck On This Archive! Just A Reminder...We Update This Blog Daily, So Check The Sidebar To The Right If You Are Stuck On This Archive! Crocheted squares are welcome and appreciated as well. Please knit or crochet squares out of the nicest, softest yarn you can afford. Any Fiber content, any gauge, your choice of pattern. It's all up to you. Just a tidbit, the blankets will be on display in several very high profile museums before delivered to the families and injured. We want to thank everyone that is knitting or crocheting these squares, we also want to thank Knitting Fever, Rowan, Susan Bates, Brown Sheep, Trendsetter, Cascade, Claudia Handpaints, Ruby Sapphire and Berroco for donating yarn and needles for us to give to Va Tech students to knit squares.